Treat yourself to an easy weeknight dinner recipe that the whole family will love! 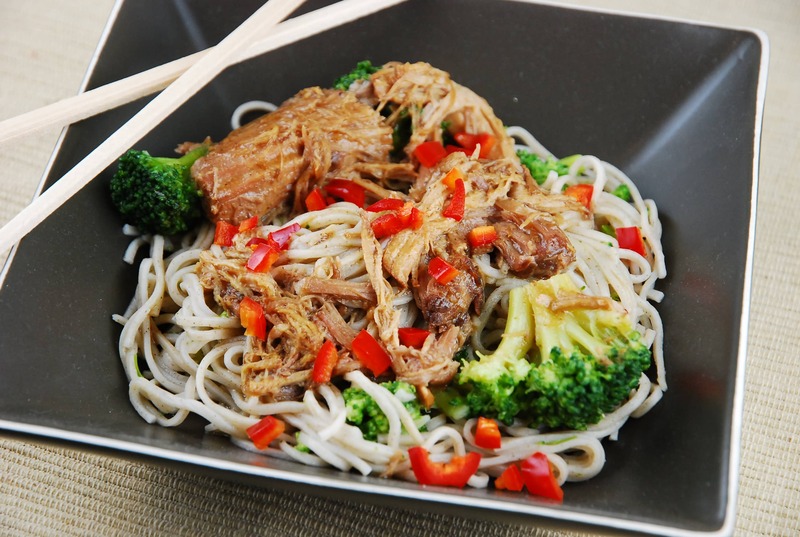 This Slow Cooker Asian Chicken and Noodles Recipe serves up chicken that has been slow cooking all day in a delightfully flavorful Asian-inspired sauce, and is ever so tender and juicy. It’s served over Japanese soba noodles and fresh broccoli, which are prepared just before serving. Everything comes together so nicely, and tastes incredible. It’s a great no muss, no fuss dish that is pretty low in Weight Watchers Points. And it reheats really well the next day, too! This could easily be made with beef, pork, or tofu instead of the chicken, if preferred. I’ll definitely be making this one again and again. Moist, tender, juicy chicken served in a delicious Asian-inspired sauce over top of fresh soba noodles and broccoli. This easy, Weight Watchers slow cooker recipe is great for a busy weeknight dinner, and tastes amazing! In a crockpot, mix together the hoisin sauce, soy sauce, ginger, garlic, sesame oil, cornstarch and 1/2 cup water. Add in the chicken breasts, and turn to coat. Cover and cook for about 6 hours on low heat. About 20-30 minutes before serving, cook soba noodles according to package directions, adding the broccoli into the boiling water during the last few minutes of cooking. Drain and divide equally into 6 serving bowls. Using two forks, shred chicken and stir in the rice vinegar. Spoon chicken and sauce over soba noodles and broccoli, top with diced chilies and serve. Just made this last night and it was a big hit! The whole family just loved it. Thank you! Love your site and this recipe in particular. Anyway you could avoid the auto-play video ads? They are super annoying and loud and generally unpleasant. Thanks! I made this–it was FANTASTIC!!! Yum! This was perfect! We’re not big broccoli fans, so I threw some peas and shredded carrot in instead, and it was divine. Definitely worth putting on the menu rotation! I think it should be hoisin sauce in the directions, not poison…tho it did make me LOL! Recipe looks wonderful…thanks! Not sure about the “poison sauce” ;). Autocorrect strikes again. I am guessing in the instructions you mean hoison sauce as opposed to poison sauce: ) Love your blog and recipes! Sounds good although I don’t think I want any poison sauce in my dish…LOL. Darn auto correct. (Check #1 of instructions). I think I will have to make this soon. “Poison sauce?” Check the spelling in your instructions!